I can remember the first time eating version of this dish as a child. My mother made it for us. 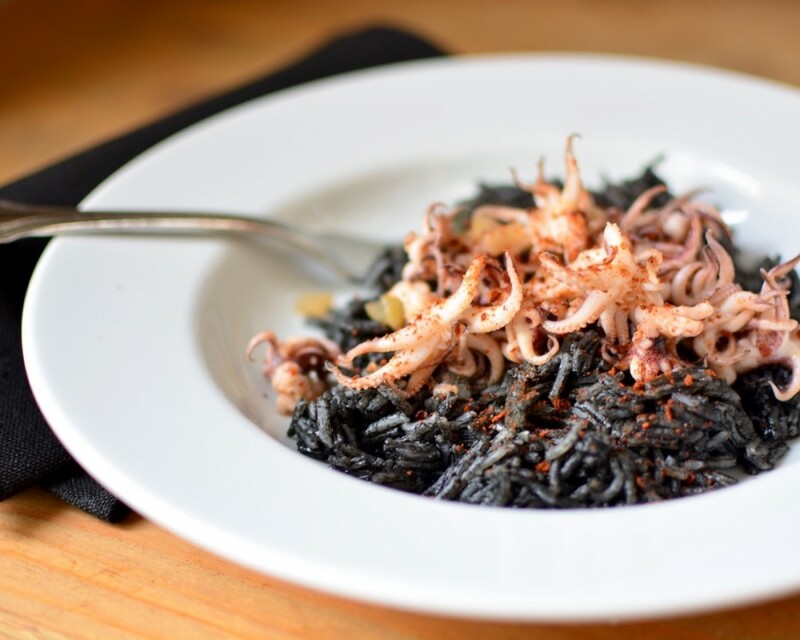 Naturally, as a young boy, it held great visual appeal for me— the grains of rice, blackened with squid ink and squid’s tentacles dangling about and beckoning for me to eat them. I’ve thought about that dish quite often, not only for it’s visual impact, but also for it’s rich and heady flavor. I had planned to make it a while ago, but I couldn’t find the squid ink. Then, I happened to find it at my local Spanish market. (Though I’m sure you could also find it online.) And with Halloween just around the corner, I’m realizing just how appropriate this dish is for this time of year. Start by heating 2 teaspoons of the oil in a medium saucepan over medium heat. Once the pan is heated, add half of the onions into the pan along with ½ teaspoon of sea salt. Cook the onions for about 5-7 minutes, until they are slightly translucent. 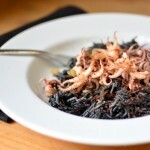 Then, add the rice and the squid ink and stir to cover the rice with the onion and ink. Then add the water or seafood stock, whichever you are using, and bring the mixture to a boil. Once the rice comes to a boil, reduce the heat to low and cover. Simmer until the rice is cooked, about 10-12 minutes. Meanwhile, prepare the squid. To prepare the squid, heat 2 teaspoons oil in a small frying pan over medium-high heat and add the remaining onions, ½ teaspoon of salt. Sauté the onions for about 5-7 minutes, or until slightly translucent. Then, add the paprika and the squid and stir. Cook until the squid is fully cooked, about 3-4 minutes. Keep warm until the rice has cooked. Serve the squid on the rice with an extra scattering of paprika. Make sure to get all of the ink out of their packets by adding a little water to the packets after you first squeeze the ink out of them.